1872: born in Ôsaka in the district of Kasaya. 1879: he makes his first appearance on stage in Ôsaka; he receives the name of Arashi Ichitarô II. January 1893: Arashi Ichitarô II takes the name of Arashi Yoshisaburô IV. February 1894: Yoshisaburô plays at the Shinmoriza (Nagoya) the role of Fujiya Izaemon in the drama "Kuruwa Bunshô". February 1901: Yoshisaburô plays in Kyôto the role of Hiranoya Tokubê in the drama "Sonezaki Shinjû". March 1903: Yoshisaburô plays at the Matsushima Yachiyoza (Ôsaka)the role of Sodehagi in the drama "Ôshû Adachi-ga-Hara". March 1904: Yoshisaburô plays at the Bentenza (Ôsaka) the role of Sagami Gorô in the classic "Yoshitsune Senbon Zakura". Spring 1904: Yoshisaburô settles in Tôkyô. October 1905: Yoshisaburô plays at the Ichimuraza the role of Yoshitsune in the classic "Yoshitsune Senbon Zakura". March 1906: Tsubouchi Shôyô's drama "Hototogisu Kojô no Rakugetsu" is produced for the first time in Tôkyô, at the Tôkyôza; Yoshisaburô plays the role of Aeba no Tsubone [casting]. 1907: Yoshisaburô joins the troupe performing at the Miyatoza. February 1907: Yoshisaburô plays at the Miyatoza the role of Jûjibê in the drama "Hikimado". August 1907: Yoshisaburô plays at the Miyatoza the roles of En'ya Hangan, Senzaki Yagorô and Kobayashi Heihachirô in the classic "Kanadehon Chûshingura". September 1907: Yoshisaburô plays at the Miyatoza the role of Danshichi Kurobê in the drama "Natsu Matsuri Naniwa Kagami". July 1908: Yoshisaburô plays at the Miyatoza the role of Tazaemon in the drama "Kirare Yosa". August 1908: Yoshisaburô plays at the Miyatoza the roles of Ishidô Umanojô and Hayano Kanpei in the classic "Kanadehon Chûshingura". February 1909: Yoshisaburô plays at the Miyatoza the roles of Kajiwara Kagetoki and Hayami no Tôta in the classic "Yoshitsune Senbon Zakura". March 1909: Yoshisaburô plays at the Miyatoza the role of Kajiwara Heizô Kagetoki in the drama "Kumagai Jin'ya". 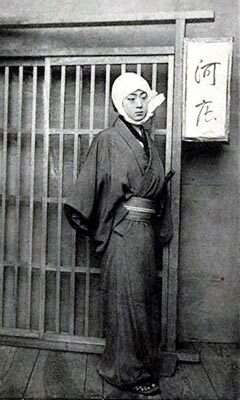 April 1909: Yoshisaburô plays at the Miyatoza the role of Momonoi Wakasanosuke in the classic "Kanadehon Chûshingura". March 1910: Yoshisaburô plays at the Miyatoza the role of Sasaki Takatsuna in the drama "Kamakura Sandaiki". His stage partners in the roles of Princess Toki and Miuranosuke are Bandô Shûchô III and Ichikawa Kuzô IV. May 1910: Yoshisaburô plays at the Miyatoza the roles of Omiwa and Soga no Iruka in the "Mikasayama Goten" scene of the drama "Imoseyama Onna Teikin". August 1910: Yoshisaburô plays at the Miyatoza the roles of En'ya Hangan and Tonase in the classic "Kanadehon Chûshingura". December 1910: Yoshisaburô plays at the Miyatoza the role of Yoshitsune in the drama "Kumagai Jin'ya". September 1911: Yoshisaburô plays at the Miyatoza the roles of Sadakurô and Teraoka Heiemon in the classic "Kanadehon Chûshingura". November 1911: Yoshisaburô plays at the Miyatoza the roles of Hosokawa Katsumoto and Kinugawa Yotarô in the drama "Date Kurabe Okuni Kabuki". December 1911: Yoshisaburô plays at the Miyatoza the roles of Tadanobu and the fox Genkurô in the classic "Yoshitsune Senbon Zakura". March 1912: Yoshisaburô plays at the Miyatoza the role of Tazaemon in the drama "Kirare Yosa". April 1912: Yoshisaburô plays at the Miyatoza the roles of Hayano Kanpei, Momonoi Wakasanosuke, Oishi and Kobayashi Heihachirô in the classic "Kanadehon Chûshingura". July 1912: Yoshisaburô plays at the Miyatoza the role of Yokanpei in the drama "Kuzu-no-Ha". Arashi Yoshisaburô IV was a tachiyaku, who was trained in Kamigata. He moved to Tôkyô and became a mainstay at the Miyatoza, performing in both Kabuki and Shinpa productions. He was able to perform a wide range of roles and enjoyed a certain popularity. He unfortunately died before reaching the peak of his career, at the early age of 40.